(NBC News) – Much of the United States is in the grips of a polar vortex, a mass of Arctic air that has pushed south from the North Pole. The frigid air is creating dangerously low temperatures not felt in the U.S. in nearly a quarter century. 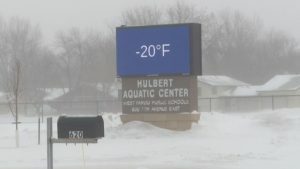 States already use to cold weather were forced to declare emergencies due to life-threatening conditions, with wind chills so low doctors warn frostbite could occur in minutes. The frigid air mass is so widespread, more than 85 percent of the continental U.S. will see freezing temperatures, with 75 million people living where temperatures are below zero. Wind chills are plummeting to 70 below zero in some places, 100 degrees below freezing.